A giant planet appears to be weakening the magnetic field of the star it closely orbits. The planet, called WASP-18b, is over ten times Jupiter's mass but is so close to its star that it completes an orbit in less than a day. The extreme tidal forces by this "hot Jupiter" are apparently changing the internal structure of the star. Chandra data show the star is acting much older than the age astronomers estimate it to be. A new study using data from NASA's Chandra X-ray Observatory has shown that a planet is making the star that it orbits act much older than it actually is, as explained in our latest press release. 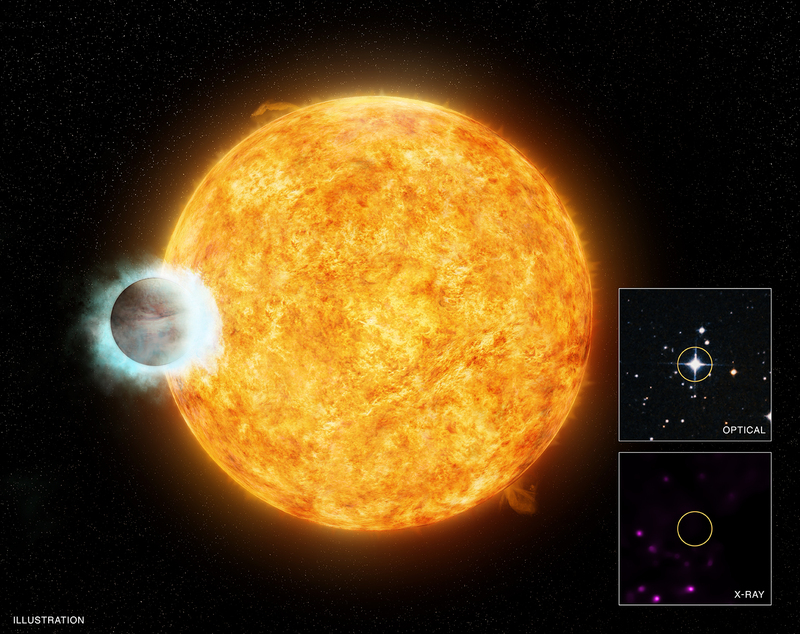 The artist's illustration featured in the main part of this graphic depicts the star, WASP-18, and its planet, WASP-18b. WASP-18b is a "hot Jupiter," a giant exoplanet that orbits very close to its star, located about 330 light years from Earth. Specifically, the mass of WASP-18b is estimated to be about ten times that of Jupiter, yet it orbits its star about once every 23 hours. By comparison, it takes Jupiter about 12 years to complete one trip around the Sun from its great distance. The new Chandra data of the WASP-18 system show that this huge planet is so close to its star that it may be causing a dampening of the star's magnetic field. As stars age, their X-ray and magnetic activity decreases. Astronomers determined that WASP-18 is only between 500 million and 2 billion years old, a relatively young age for a star. Given this age, astronomers expect that WASP-18 would be giving off copious amounts of X-rays. 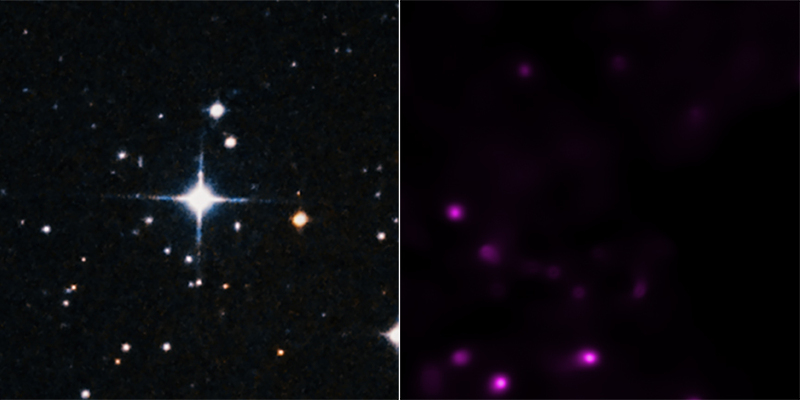 Surprisingly, the long Chandra observations reveal no X-rays being emitted from WASP-18, as seen in the lower inset box. The same field-of-view in the upper inset box shows that in optical light WASP-18 is a bright source. Using established relations between the magnetic activity and X-ray emission of stars and their age, the researchers concluded that WASP-18 is about 100 times less active than it should be at its age. The low amount of magnetic activity from WASP-18 is shown in the artist's illustration by the lack of sunspots and strong flares on the surface of the star. The weak X-ray emission from the star has relatively little effect on the outer atmosphere of the nearby planet, giving it a symmetrical appearance. By contrast, much stronger X-rays from the star CoRoT-2a are eroding the atmosphere of its nearby planet, producing a tail-like appearance. Tidal forces from the gravitational pull of the massive planet - similar to those the Moon has on Earth's tides but on a much larger scale - may be responsible for disrupting the magnetic field of the star. The strength of the magnetic field in a star depends on the amount of convection, the process by which hot gas moves around the stellar interior. The planet's gravity may cause motions of gas inside the star that weaken the convection. Because WASP-18 has a narrower convection zone than most stars, it is more vulnerable to the impact of tidal forces that tug at it. The effect of tidal forces from the planet may also explain an unusually high amount of lithium found in earlier, optical studies of WASP-18. Lithium is usually abundant in younger stars, but over time convection carries lithium to the hot inner regions of a star, where it is destroyed by nuclear reactions. If there is less convection, the lithium does not circulate into the interior of the star as much, allowing more of it to survive. These results were published in the July 2014 issue of Astronomy and Astrophysics and are available online. The first author is Ignazio Pillitteri of the Istituto Nazionale di Astrofisica (INAF)-Osservatorio Astronomico di Palermo in Italy. The co-authors are Scott Wolk of the Harvard-Smithsonian Center for Astrophysics in Cambridge, Massachusetts; Salvatore Sciortino also from INAF-Osservatorio Astronomico di Palermo in Italy and Victoria Antoci from Aarhus University in Denmark. Coordinates (J2000) RA 01h 37m 25.00s | Dec -45° 40´ 40.30"
Observation Time 23 hours 43 min. An exoplanet about ten times Jupiter's mass located some 330 light years from Earth. About 330 light years from Earth. Insets: X-rays from Chandra & Optical from DSS. About 0.5 light years across. Inset image X-ray pink, optical red, green and blue).